Unique arts and crafts are accessible in just about every community of the Northwest Territories. In larger communities, shops and galleries offer a broad selection of northern art, crafts, sculpture and jewelry. 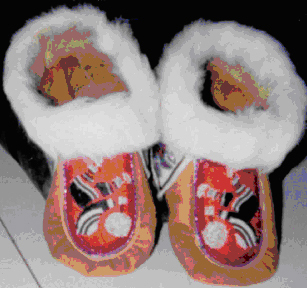 In smaller communities, like Aklavik, there may be a local specialty, for example, moccasins, tufting work, birch bark baskets or canvas products. Two of Aklavik’s prominent artists are featured below; Robert Buckle and Robert Papik. Northern festivals provide an opportunity to purchase unique collectibles and to meet local artists. Nearly one hundred artists from across the Northwest Territories participate in the Great Northern Arts Festival, held annually in Inuvik. Smaller events are held each summer in Fort Simpson, Yellowknife, and Fort Smith. The NWT Arts and Fine Crafts Database contains facts about artists and art organizations within the Northwest Territories that have chosen to share information about themselves. This information is available to everyone who visits the site, thereby helping to strengthen the northern arts community and promote northern arts both locally and globally. Click here to search the database. Carvings by Inuvialuit, Gwich’in and Metis artists often reflect life in the Arctic; majestic polar bears and muskoxen, birds, depictions of hunters and dramatic images of spirit figures or shamans. Carvings are pieces of artwork that share with us stories of the land, its people and its wildlife. Robert Buckle is a proud member of the Aklavik art community who annually attends the Great Northern Arts Festival in Inuvik. Robert is a skilled carver who has recently began focusing his artistic flare on the production of northern jewelry. He won the Emerging Artist Award the year after completing his jewelry program at Aurora College in 2001. Robert was also the deserving recipient of a NWT Arts Council grant that will aid in his purchase of equipment to further extend his range of artwork. Richard Papik has been creating charming beadwork designs since 1965. He was taught the skills of beading by his respected elders. Richard loves to experiment with different variations of color and design. Local Craft Shop. Please contact for details. Anna Illasiak, Rosie Archie, Nellie Arey, Elizabeth Semple, and Effie Greenland. Inquiries into their artwork can be directed towards the Hamlet Office, Aklavik Community Corp, or Aklavik Indian Band. Please use the contact us page for their individual contact information.